During May, Polish artist Miroslaw Balka's new sculpture installations appear in two places at once. Both exhibitions are site-specific in that they are tagged with their AMSL, their height above mean sea level. The first is at the Freud Museum, The Interpretation of Dreams (Die Traumdeutung), 75,32m AMSL. Outside the house, there is a black 8-metre high tower ("Y Chromosome Adam"). In the entrance, you will find the video "Night and Fog" (Nacht und Nebel). "We still need" sits in the main exhibition space and consists of painted plywood crates and a truncated trapezohedron that references Dürer's Melencolia 1 (1514). The final work is a recording of someone whistling Elmer Bernstein's theme tune from the Great Escape (1963). The second exhibition (part of which is shown above) is at White Cube Mason's Yard, The Interpretation of Dreams (Die Traumdeutung), 25,31m AMSL. One work, "100 x 100 x 20, TTT", that consists of two parts (see pic above). 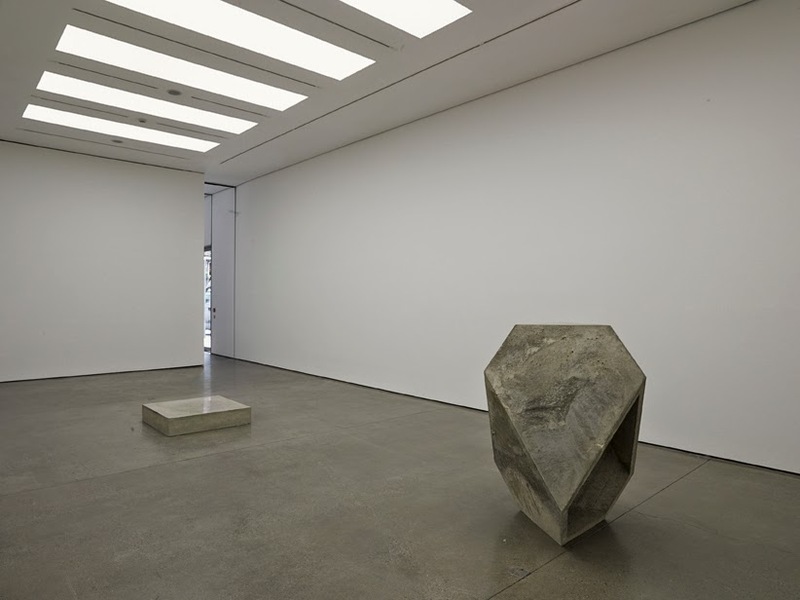 On the left, there is a low, square concrete box set on the gallery floor. It could be an underground chamber; if you lean over and look through the two peepholes in the top, there seems to be a mysterious light within. Can you shelter and be safe here? Or is it a gleam from another realm, a last resting place? On the right we find a truncated trapezohedron made of concrete with a fascinatingly radiant marbled surface (which may itself reference the remodelling of buildings brought down by war) and one facet open at the back. It could be a hiding place, a gun emplacement, a sniper's hide; it could be a prototype structure rising from the ashes. It also references the Dürer, just like the work in Hampstead. It also references the dwarf Alberich's magic helmet in Wagner's Das Rheingold, the helmet that, once put on, renders the dwarf not only powerful but invisible. Here the whole room is the sculpture, with the ceiling height drastically reduced by means of sections of steel chain lock fencing. The way the room has been left empty really makes this work speak, soundlessly, to the viewer. It references the long agony endured by war prisoners. Our imagination fills in their presence; their absence. The work also references the low point: in the cage, real or imagined, neither fight or flight is possible. Echoing the work at the Freud Museum, here is the same sound sculpture, this time a many-voiced whistling of the Great Escape theme.